« Guess we should find names! I’m SO happy for you! What a triumph. I can’t believe they are finally here. Welcome, Grant and Marshall! They are absolutely beautiful. Congrats!!!! *William is my boy twin’s middle name as well:)* I hope things went alright for you and if you had a c/s, you were able to follow your birth plan at least a little bit. And also, I hope you can finally pee again. I cannot imagine anything worse!! 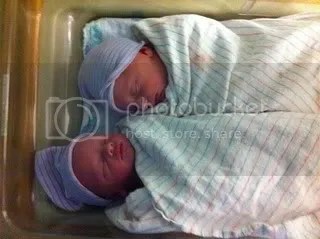 Congrats again and welcome to the insanely crazy world of twins! Awww, man! For some reason, I can’t see the pic. So happy for you, though, and love the names. Congratulations and welcome, baby boys!! Congratulations again Cathy. Can’t wait to see you and them and snuggle them up! Congratulations!!!! !They are so gorgeous! I hope your recovery is quick and easy!! The are gorgeous a very big congrats to all of you! Congrats Cathy! They are beautiful! They are lovely, congratulations!!!! Owen will be a lovely big brother.